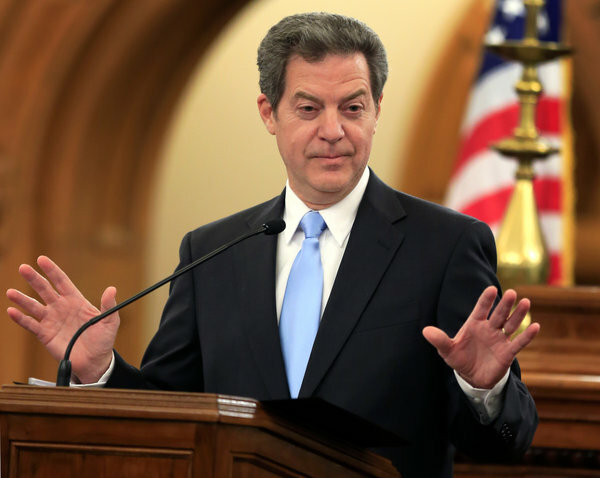 Those who have been following the news are aware that Kansas under Governor Brownback has dramatically cut taxes and is trying to cut spending at the same time. As a result, the economy of Kansas has grown at half the national rate over the last year. The state government is facing serious deficits because there has been an unforeseen falloff in tax receipts on the order of $53 million. The expected increase in growth from tax reductions has not been realized. As a result, funding for the state’s primary and secondary schools was cut, but the State Supreme Court over-ruled the cuts, saying the state’s constitution forbade such niggardliness. The Republicans in the state’s legislature have reacted angrily and accuse the Supreme Court of “activism” and meddling in politics. Large amounts of money have been applied to political ads in an attempt to influence the State Supreme Court’s “retention” elections. Details for those not familiar with Kansas’ system of retaining judges: first, the Supreme Court judges are nominated by a nonpartisan committee and selected by the governor from among the nominees. Second, after six years in office, the judges are subject to elections in which they run without opposition but are removed if they don’t command a majority of the vote. Many states have similar elections, but the US federal government doesn’t have judicial elections. As a result of these retention elections, the judges are vulnerable to the same type of money-fueled advertising that infects legislative and executive elections. Several states, Wisconsin, Arkansas, and Oklahoma among them, have had large amounts of money injected into judicial elections recently. In Pennsylvania, Democrats were able to retain judges they felt were sympathetic by winning the money-advertising war; in most other states, the Republicans have won. Spending on ads in judicial elections exceeds a million dollars in each of these small states. This comment is in response to an article in the NYT about the situation in Kansas, a state particularly hard hit by Tea Party Republicans and their plans to reduce taxes and spending. Next-door neighbors Kansas and Colorado, both featured in the New York Times today, offer a stark illustration of the difference between moderate, pragmatic leadership of Democrats and the right-wing extremism of Tea Party Republicans. Colorado is blossoming with good jobs, smart investments in education, and a beautiful, well protected environment — it’s one of the top destinations in the country for creative people. Kansas, by contrast, is traveling the road to poverty and ignorance, unable to pay its bills, its economy falling apart, smart people fleeing the state in droves, its public schools in crisis. Its elected officials obsess on their right-wing Christian agenda instead of offering stewardship and leadership to the state in an economic crisis that was created by their own bad leadership. Elections have consequences, people. Whatever you do, don’t let the wrong people get elected because elections have consequences. Please keep that in mind this November. Here’s a picture of Governor Sam Brownback from the NYT. Doesn’t he look evil?